From May to December 2003 a trial excavation was conducted at the Giv‘ati car park, located outside the Dung Gate of the Old City, along the western fringes of the City of David (Permit No. A-3834), prior to the construction of an underground parking lot. The excavation, on behalf of the Antiquities Authority, was directed by E. Shukron and R. Reich, assisted by the El‘ad Association, the Company for the Development of East Jerusalem, the Nature and National Parks Authority, Elena Tchernov (archaeological assistance), V. Essman, T. Kornfeld and V. Pirsky (surveying) and T. Sagiv and C. Amit (field photography). Excavations in the area were carried out in the past, including Macalister and Duncan (1923–1925)––east of the current excavation area, Crowfoot and Fitzgerald (1927)––south of our area and Kenyon (1961–1967)––northeast of the area. The southwestern corner of the parking lot was the area chosen for the sounding. Four elongated rectangles, totaling c. 200 sq m, which are approximately 5% of the total area, were opened. A 4 m thick alluvium layer was removed by mechanical equipment from the entire excavation area. Manual excavation began when the tops of walls first appeared. Building remains and installations, dating to the Islamic and Byzantine periods (two phases), as well as a few remains from the Roman and the Second Temple periods, were uncovered. Building remains were not exposed in the alluvium layer, which contained a few potsherds from the Middle Ages and sporadic building stones. The sole architectural feature in this layer was the built shaft of a water cistern. It later turned out that the cistern was built during the Byzantine period (below) and continued in use during the Early Islamic period. Later, the addition of a built shaft raised the mouth of the cistern, which in the Middle Ages was situated in the middle of a large open lot devoid of structures. The upper stratum of buildings was exposed only in the eastern part of the excavation area. The remains of a stone-built residential structure with rather shallow foundations were discovered. Numerous dressed and worked stones were incorporated in its walls, in secondary use. These were dismantled from walls of the earlier stratum, as evidenced by the deep robber trenches visible there. The building, whose exposed part included a large, c. 7 m wide area enclosed with walls, had beaten-earth floors. The water cistern (above) and a conduit that conveyed water to it were in this area, as well as two square pillars in the center that probably supported a roof over the whole or part of the area. A preliminary review of the potsherds associated with the rooms of the structure and the presence of a ceramic lamp in the robber trench of an earlier building indicate that this stratum of buildings was, most likely, from the Early Islamic period. An inscription with Hebrew letters (Fig. 1) was discovered in this stratum. The second line can be completed as:בר יעקב . On the face of it, the inscription could have 'surfaced' from an earlier stratum, as when foundations for a house were dug; however, it is unlikely to find a Hebrew inscription from the Byzantine or Late Roman periods in this area, whereas at the end of the Second Temple period marble slabs were not yet used. This Hebrew inscription fragment is connected to the identification of the Jewish neighborhood that existed in the southern part of the city from the Early Islamic period almost until the Crusader conquest (seventh–eleventh centuries CE). The neighborhood was identified and located, according to historical sources, in the southern part of Jerusalem, between the Temple Mount in the north and the Shiloah Pool in the south. Some scholars identified this area with the Karaite quarter, known also from historical sources, whereas others recognized it in the Silwan Village. The remains of the ‘Menorot House’ revealed in B. Mazar’s excavations near the southwestern corner of the Temple Mount were related to the same Jewish neighborhood. The current excavation area lies exactly in the center of the proposed area and the Hebrew inscription fragment confirms this proposal. Building remains from the Byzantine period were unearthed throughout the entire area below the Early Islamic stratum; two distinct architectural phases and a few occupational phases, represented by several floors, were discerned. Phase 1. A series of walls aligned east–west and walls perpendicular to them were built in the area. The walls were constructed in an orderly fashion, attesting to careful planning that did not relate to earlier remains. The Byzantine construction attempted to level the sloped terrain, whereby the east–west oriented wall foundations were built to a slight depth in the east (c. 1.0–1.5 m) and to a considerably greater depth (c. 3–4 m) in the west. The elevation of the new residential neighborhood was determined by the levels of the nearby principal streets, allowing traffic toward the secondary cardo of the city, passing close by to the west, to run along a gentle incline. The walls had deep foundations that were partially set on walls and installations of earlier levels (below). They were built of dry construction, using small fieldstones not arranged in courses. The superstructure comprised a mix of dressed stones and fieldstones, which were coated with a layer of lime plaster. One of the rooms contained fragments of painted plaster. The various floors in the rooms were composed of small stone slabs, plain white mosaic and beaten earth. A water cistern was built between the two main parallel walls that traversed the excavation area from east to west. The cistern was entirely founded upon an ancient stone platform whose nature has yet to be ascertained. The elliptical-shaped cistern (max. dimensions 2.1 × 4.3 m) had curved, rather smooth corners and was coated with plaster characteristic of the period, containing crushed potsherds that rendered it a pinkish hue. The ceiling of the cistern consisted of three stone arches; the spaces between them and the cistern's walls were covered with stone slabs. The top of a square opening in the eastern end of the cistern’s ceiling was at the same elevation as the floor next to the cistern. Two gutters conveyed water to the cistern—a built gutter from the south and a ceramic pipe from the east. The cistern was found nearly empty. A gray layer that accumulated on its bottom contained several potsherds from the Middle Ages, the last period when the cistern was used. Phase 2. Several structural changes occurred during the Byzantine period. Some of the walls in the eastern part of the area were reduced in height to create a leveled area that served as an alley, oriented north–south. Two floor layers, lying one atop the other with no fill separating them, were exposed. The earlier floor consisted of small stone slabs. The upper floor was a pavement of medium-sized rectangular slabs that overlaid a built and covered drainage channel, running north–south. A stone with a hewn, shallow circular depression for gathering water was incorporated in the alley’s pavement. A built water channel covered with small stone slabs extended from the hewn depression westward. The channel was well-plastered and had a curved bottom; it continued in its entirety toward the western edge of the excavation, clearly bypassing to the north the water cistern described above. It is, therefore obvious that the channel drained muddy water flowing in the alley, in an attempt to divert it from the mouth of the cistern, which collected water from the adjacent rooftops and courtyards. The channel was built next to the northern side of one of the main walls in the area. It indicates that the bottom of the Tyropeon valley, extending across the area from north to south and located west of the excavation area, was still a sunken valley where water flowed, although it was considerably filled up and leveled in later periods. The walls underwent several changes. One of the walls was widened on one side, so that the floor of the adjacent room extended over its earlier part. Various types of floors were also used in this phase, mainly coarse plain white mosaic, small stone slabs and beaten earth. This stratum of dwellings showed no traces of destruction, such as collapse or conflagration; hence, the area was apparently abandoned and neglected. Future study of the coins and pottery vessels recovered from the latest floors of the stratum will allow a more accurate assessment concerning the time when the area was abandoned. Archaeological remains, dating to the end of the Second Temple period, were detected in two places. A stepped water installation coated with gray plaster was exposed in the eastern part of the area; its entrance was damaged by the Byzantine water cistern. The installation was identified as a miqwe (ritual bath) of a type characteristic of the period. Similar installations were uncovered nearby by Macalister and Crowfoot, though the latter did not recognize their essence. In the western part of the area, below the foundations of one of the Byzantine walls, a room that was originally covered with a barrel vault of dressed nari was discovered. Only the lower courses of the beginning of the vault survived; yet, it suffices to date the structure to the first century CE. The eastern part of the vaulted chamber was partially leaning onto a wall of medium and large-sized fieldstones, of which a section of the western face was exposed. The wall predated the vault remains, but at this point it can not be dated. The soil fill inside the vaulted chamber yielded a considerable amount of potsherds, fragments of stone vessels and weights, all typical of the end of the Second Temple period. This residential building joins other similar buildings of the period, which had been revealed in previous excavations in the area, and belonged to the ‘Lower City’ of the Second Temple period. It should be mentioned that the orientation of the miqwe and the vaulted room was identical and they undoubtedly belonged to the same residential building, whose greater part was destroyed by the Byzantine foundations. It should also be noted that in Crowfoot and Fitzgerald’s excavations, located south of our excavation area and east of the line where a wall of medium fieldstones was exposed this season, a massive wall had previously been found. It was built of coarsely dressed medium-sized stones and had an opening that was identified as a gate in the western fortifications of the City of David. The soil fill west of the gate contained a large quantity of potsherds from the end of Iron Age II, mixed with Second Temple-period fragments. 1. Jerusalem, City of David, Giv‘ati car park. 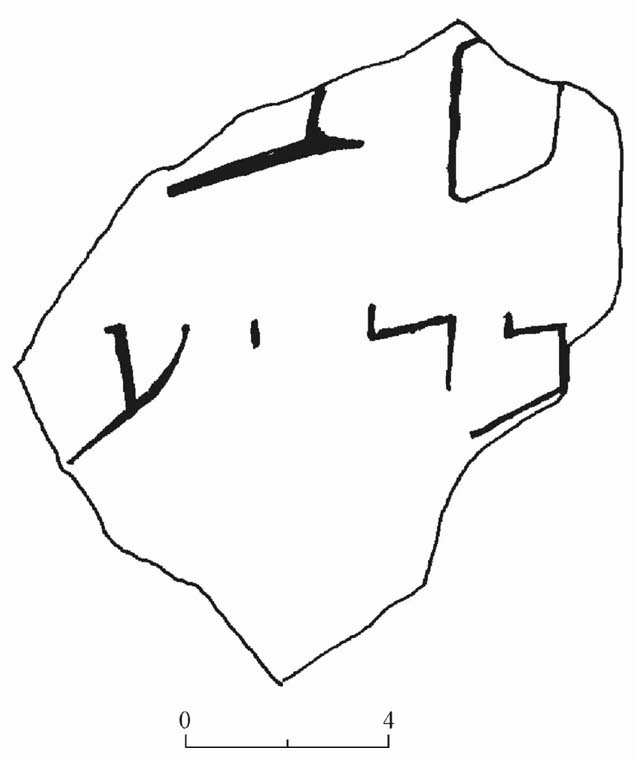 Fragment of a Hebrew inscription.